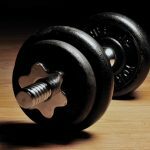 Are Fixed Dumbbells Better than Adjustable Dumbbells? You’ve made a commitment to start working out and stick to it. Maybe due to health reasons, or maybe just to help you build muscle and strength. 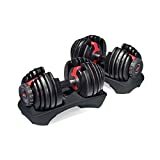 However, now you need to consider which type of dumbbell to purchase, to lead you to the realization of your fitness goals. There are two types of dumbbells: Fixed and adjustable dumbbells. So, between these two which should you buy? First of all, let’s take a moment to distinguish between fixed dumbbells, and adjustable ones. This particular type of dumbbell is also known as a regular dumbbell. Some refer to them as traditional dumbbells because they have been around for a long time, as compared to adjustable dumbbells. The weights on a regular dumbbell are fixed and cannot be adjusted. 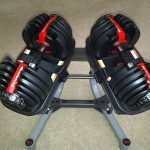 Regular dumbbells come in two styles: hex and pro style, which are usually distinguished by the shape of the weight heads. An adjustable dumbbell, however, can be adjusted. In other words, the weights can be increased or decreased to suit your workout. There are two types of adjustable dumbbells: selectorized, and plate-loaded adjustable dumbbells. Traditional dumbbells appear to be a lot more affordable compared to the adjustable variety. However, you will need more than just one set of dumbbell to fit the different types of exercise you might want to take part in. Adjustable dumbbells allow you to change the weight as you wish. Hence, you’ll probably only need one set of adjustable dumbbells. A pair of good, cast iron dumbells start at around $10 and move upward in price depending on the weight. 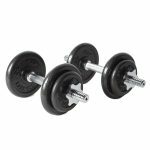 After adding the cost of all the individual dumbbells you need, you may quickly approach or exceed the price of adjustable dumbbells. 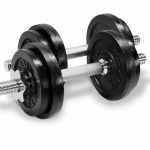 Conversely, those with modest needs that gravitate towards 5, 10 or 15 pound weights can save money by going with traditional dumbbells. So the better bargain depends on your needs. Adjustable dumbbells take up very little space in your exercise area or room. The regular ones require you to buy more than one set and end up taking up a lot more space. 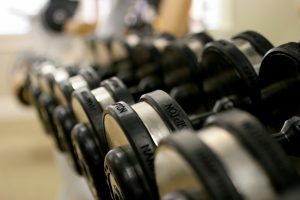 Hence, can lead to a cluttered room and could be dangerous if not put out of the way; so you’ll want to invest in a dumbbell rack. Each type of dumbbell is structured differently. The regular dumbbells are usually set hence the weights cannot be shifted or changed. This gives the individual working out confidence that the weights won’t fall out and cause injury during the workout. As previously mentioned, the weight heads of the regular dumbbells come in two shapes: round and square shaped. The square ones stay in place and do not roll over, reducing the chances of an accident. Furthermore, the weight heads are usually rubber coated to protect floors from getting scratched. This is where adjustable dumbbells really take the cake. With just one set of of adjustable dumbbells to focus on, it’s much faster to transition to the next set of the workout. Bowflex in particular has made it really easy to change the amount of weight. Simply turn the dial at the end of the barbbell in increments of 2.5 or 5 pounds to reach the desired setting. 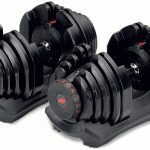 Adjustable dumbbells have wow factor and are certainly impressively engineered, but the plastic and rubber components may wear down or break more easily than a bullet-proof traditional dumbbell. There’s more to go wrong. On the other side of the coin, adjustable dumbbells are rugged in their own right. And in real world applications few people complain about failed parts or wear. When you make purchases through links on infospike.net, we may earn an affiliate commission. Copyright © 2019 Best Fitness Programs. Powered by WordPress and Themelia.